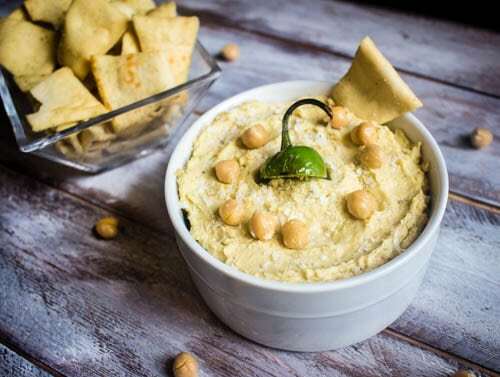 This easy, homemade hummus is a healthier spin on jalapeno popper dip! 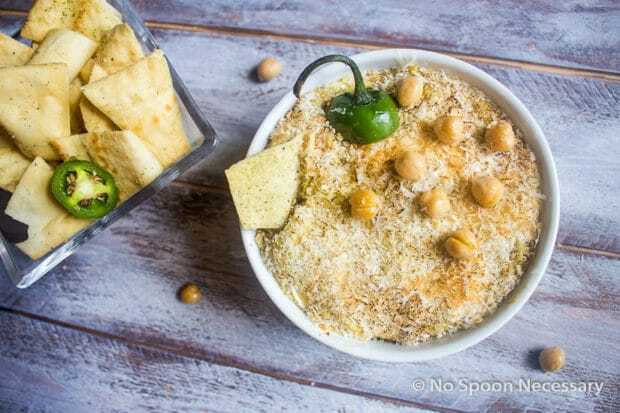 Slightly spicy, creamy and packed with flavor, this jalapeno popper hummus is guaranteed to become a household favorite! I love chickpeas. My Mother and Boy detest them; my best friend is “not a huge fan”. Suits me just fine, more for ME! I do not really understand what exactly about this wonderful, protein packed, little gem of smooth, creamy deliciousness puts them off. Anyone? Help me understand this… feel free to just answer. It is not necessary to raise your hand and wait to be called on. I run a very lax food blog here. I think they are wonderful. You can toss ‘em in some spices and roast them until they are crispy for a (highly addictive) snack. You can add ‘em, rinsed and raw, to a salad for some extra punch. 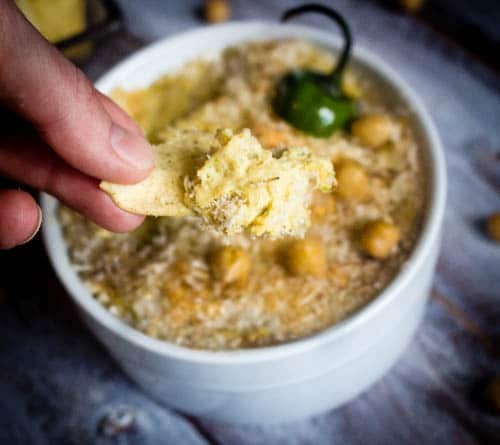 Or you can make this… holy moly, get a fork (or fingers) ready, soooo lip smackin’ good…Jalapeno Popper Hummus Dip. I adore hummus. Its light, airy texture is perfect for this time of year, where it is so gosh darn hot out, you wish you lived in an Igloo. And, I adore jalapeno poppers (duh, it’s spicy, of course I LOVE them). When I thought of combining the two, I was utterly floored to find NO ONE had thought of this marriage between them yet. Then, I immediately got to work testing and developing a recipe because I will be damned if someone beats me to this punch!!! So obviously, guess what I’m delivering to you today? From my kitchen to yours…. 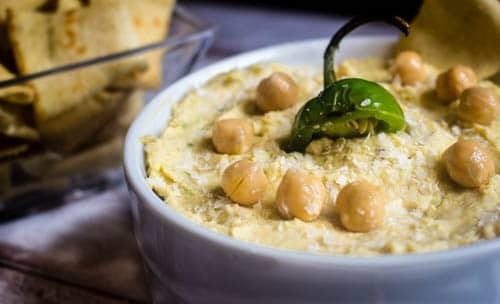 Jalapeno Popper Hummus. Genius. I. Know. I took all the yummy-yummy, scrumptious in my tummy ingredients, for both a jalapeno popper and hummus, did a little culinary splicing of ingredients, and came up with this magical culinary specimen. Cream cheese? Yup! Cheddar? Uhh huh!! Chickpeas? Well of course! Delicious? You bet your forking bottom it is!!!!! I prepared this two ways. I mean, why in the heck not? You have a good thing, you ride that train all the way to the station! Then post it on your blog to share the foodie love. Both are extraordinary… it really depends on your taste and if you want to turn your oven on or not. Make it really taste like a jalapeno popper… top it with some panko breadcrumbs, a smidge more of parmesan to give it that traditional ‘popper’ crunch, and bake it. Only long enough to brown the top. So it still maintains a cool center, but gives the hummus an added layer of flavor when you dig in. Preheat a grill or grill pan over medium high heat (or heat a broiler to high). 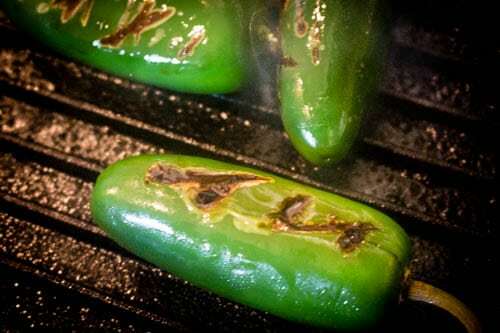 Grill the jalapenos until well charred, turning occasionally, for about 10 minutes total. Remove jalapenos to a clean work surface. De-stem, de-seed and roughly chop jalapenos. 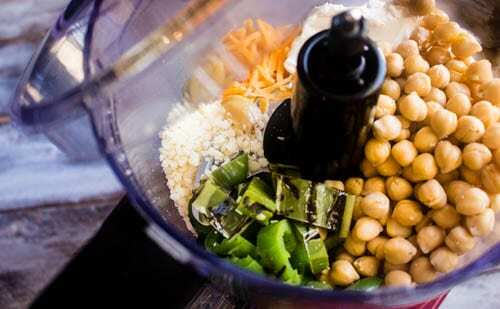 In the bowl of a food processor, combine hummus ingredients (Jalapenos – Salt and Pepper). Pulse for about 30 seconds, to just barely combine ingredients. Using a spatula, scrape down the sides of the bowl. Process, while slowly drizzling in olive oil (through the opening in the top… don’t attempt to do this with the lid off! ), until a smooth, or desired texture, is achieved. Taste and adjust for seasoning. *If you like a thinner consistency hummus add 1 TBS of water at a time, while pulsing, until desired smoothness is achieved. Transfer hummus to a small, individual sized casserole dish or ramekin. 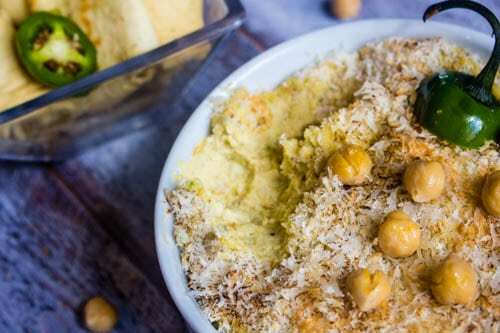 Sprinkle the panko bread crumbs and remaining Parmigiano-Reggiano over top of the hummus. Bake for 10-12 minutes, or until top is slightly browned and bread crumbs are toasted. Garnish with jalapeno slices and grated parmesan, if desired. Serve immediately with pita chips, raw vegetables, pretzels, bread… use it as a spread on a sandwich… eat it with your fingers… just Enjoy! Love it, I’m a hummus FANATIC! lol….I started making my own when I realized not only is it cheaper but in my personal opinion, it tastes better 🙂 Always looking for new and different variations of hummus, I added last week to my basic hummus, bacon bits and liquid smoke (amazing!) I loved your recipe cause spicy is my life and who doesn’t like cream cheese!? Definitely among my favorites! And firsts that I will try soon! 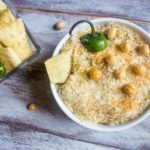 I love jalapenos, cheese and chick peas! Sounds like a mix made in heaven! Thanks, Cheyanne! You are the bomb!!! 🙂 Yay! Do try it. So great to have a friend with good taste!! Then again, its nice Boy doesn’t like chick peas because I got to eat all of this. I’m a hog! I enjoy being quoted correctly! 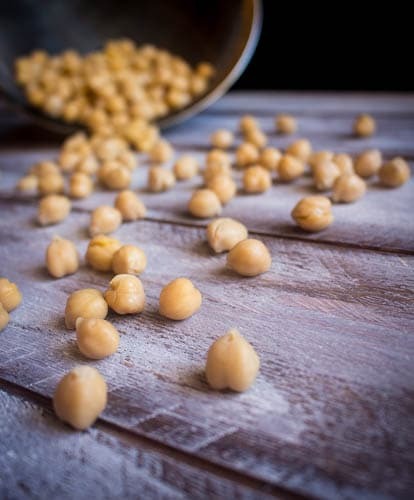 Give it a try, you might surprise yourself and find you actually really like chick peas!